Come to Dazzle, Sarah Bernhardt’s Australian tour, 1891. ‘A meteor come to dazzle’ was how one critic described Sarah Bernhardt during her wildly successful tour in 1891, an event which quickly became a legend in Australia’s theatre history. And ‘wild’ it certainly was: the publicity, the huge welcoming crowds and the ‘hype’ were unmatched until the Beatles arrived in the 1960s. My story of this internationally famous French actress came about when I made two discoveries about the Divine Sarah. In the early 1990s I gave a U3A course about famous actresses and in 1992, for Canberra Repertory, I directed Ronald Harwood’s play, After the Lions, which is about Sarah after the amputation of her right leg and her subsequent visits to wounded soldiers of the First World War. One discovery, that she had come to Australia, followed a remark in Harwood’s play about the rudeness of Australian audiences. The other was that it was very difficult to find out anything about that tour. Though she was already the subject of many biographies, laudatory and otherwise, no one had written about her coming Down Under. At best, it was passed over in a single sentence and that rarely. So I set about finding out. According to one British source she went to Australia in October 1891. Not according to any Australian sources I consulted; October journals were silent. What I did find out was amazing. What a proliferation of newspapers! In Sydney, Melbourne and Adelaide from May to August which all contained columns and columns about Sarah, as did pro and con letters to editors, lampoons and cartoons in the Bulletin and manifold, short-lived, usually tasteless, satirical journals I had never heard of: including the remarkable Bird O’ Freedom in Sydney, Boomerang in Melbourne, and Quilp in Adelaide. I had a wonderful time in interstate libraries and I learned about so much more than the Sarah extravaganza. I learned about the spectacular theatre of the late nineteenth century, often under the auspices of J C Williamson but also of Bland Holt, Dampier, Rignold, Brough, and Boucicault; I learned about the politics and events of the astonishing 1890s. I was full of admiration for the reporters and critics of the time, particularly for Gerald Marr Thompson, who put all his true opinions into a revealing diary. I became so steeped in all of this that I made it, first, the subject of a Master’s degree at the University of New England which was picked up by Currency Press and the National Library and became Come to Dazzle. Winner of Canberra Critics’ award, 2000. Co-written with Margaret Fead, former Life-member and archivist of Canberra Rep. In 2000 my friend and fellow Repertory life-Member Margaret Fead and I got together to write a history of Canberra Repertory’s extraordinary Old Time Music Hall which was then in its 26th year. It was to continue for another eight years, closing sadly for both performers and audiences in 2008. 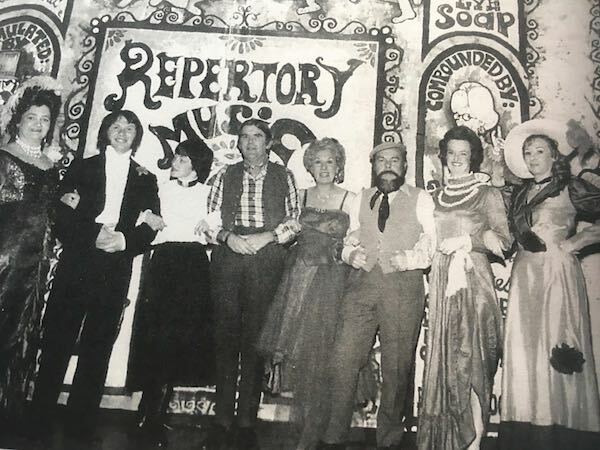 The Music Hall had started as an in-house entertainment put together by some of the cast of our production of Stockade at the Canberra Theatre in 1974. It was the brainchild of members Helen Wilson and Rosemary Hyde and featured our favourite party pieces. Staged very much against the wishes of the prevailing Council who considered it not a proper part of Rep’s theatrical ethos. They eventually gave in with the provisos that it was to be no budget, costumes only from the existing wardrobe, no paid publicity and for four nights only in our own Theatre 3. It was July so we fed cast and crew and wooed audience members with a hot supper at interval: ‘beef stroganoff’ in the foyer, ‘warmed-up dogfood’ backstage; a stew by any name still tastes good. Well, it brought the house down—and changed Council opinion. Despite it being a winter production, within a very short time the show had stretched from four nights to four weeks to six weeks. As audiences grew and front of house space diminished, staff had to declare the beef stroganoff ‘off’ and sandwiches were substituted. Whenever bookings opened queues formed from the foyer to the cold outside; sympathetic staff members ran in and out with cups of tea. Fund-raising bulk bookings by charities took up huge blocks of seats and before long Repertory was rolling in money. Music Hall continued to grow in size, costs, demands on performers and supporting production team, especially the expert costume and set designers and makers. It took a toll on health and fitness—but not enthusiasm—and soon had to move to a bigger venue and shorter, less exhausting but more lucrative seasons at the Australian National University and then at the Playhouse Theatre. Throughout the thirty-four years that the show played to full houses it was fronted by director and leading performer, Queen of the Old Time Music Hall Rosemary Hyde, by MC Russell Brown who was also set designer and building convenor and, for much of the time, President of the Society. Andrew Kay and Norma Robertson were the maestros on the two pianos, Norma latterly bequeathing her stool to Pauline Sweeney. The original four were known admiringly and affectionately as the Mafia. Many performers, too many to name individuals here, became great favourites and appeared very willingly year after year. But among the too many to mention off-stage stalwarts, some ‘without whom’, who must be recognised for their years, in some cases decades, of uncomplaining, expert contribution to the phenomenon were: Jeanette Brown (costumes and Front-of-house ‘sandwich queen’, Lynne and Tony Ashcroft, (costumes and lighting), Maureen Newman (costumes), Ian Croker (backdrop artist), Nola Daly, Dot Russell and Darren Boyd (stage managers), Cheryl Eggins, Jan Carey (choreographers), Sandy Daly, Chris Ellyard (lighting), Margie and Bill Ryan (FOH; Bill was emergency contact; whenever Russell began his ’squirrel joke’ Billl knew something was amiss backstage and ran back to help put ir right). In all the years right up to the final curtain in 2008, way beyond the scope of this book and apart from sharing the original with Helen Wilson, Rosemary Hyde missed only two Music Halls; in 1980 direction was handed over to Ian Howard, in 1991 to Colin Anderson; Andrew Kay was absent for two performances: one for the birth of his daughter and one for the Sydney to Hobart Yacht Race. A 34-year phenomenon indeed, presented with abundant pride, but good things eventually have to come to an end and the last ‘Goodbyeee’ and ‘Andrew’s Anthem’ were sung in 2008.